Spiky, prickly leaves with pink or violet flower burs. Though the entire plant has liver protecting properties, the seeds have the strongest effects on the liver. Milk thistle seed contains silymarin, a compound shown to protect the liver, and to accelerate the regeneration of liver cells. As an antioxidant milk thistle can help reduce oxidative damage to the liver. Used as a liver protectant and healer, to treat spleen problems, to protect the kidneys, as an antioxidant, and to protect the system from heavy metal damage. Milk Thistle blocks toxins entering the liver and cleanses toxicity out of the liver cells, a good (temporary) process during any cleanse and detoxification process. Milk thistle raises levels of SOD, interferon, and T-lymphocytes. Leaf tea used for skin problems, rash and tuberculosis. Root tea used for bowel issues like worms and diarrhea. You can make a lemonade from thistles. Juice or blend, strain out prickles or pulp, add lemon and optional honey. As for pure food, the root is the easiest survival food. Bull thistle for example has a pretty hefty root. Can be eaten raw or cooked. Young plants are best. Unopened flower buds, raw or cooked. the name of many thorny plants of the family Compositae, mainly of the genus Onopordum. There are more than 40 species, distributed in Eurasia and North Africa, chiefly in Mediterranean countries. Of the approximately ten species found in the USSR, the most common is the Scotch thistle (O. acanthium), a biennial weed with a prickly, dentate, and winged stem and large thorny leaves. The plant’s lilac-pink flowers are gathered into large solitary heads. The fruits have pappi. 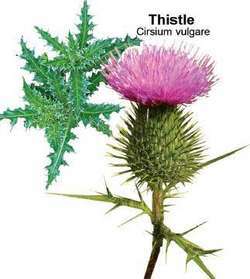 The Scotch thistle is found in the European USSR, the Caucasus, Siberia, and Middle Asia. Any of the various prickly plants comprising the family Compositae.